AUSTRALIA'S # 1 ORGANIC TURMERIC STORE - SHOP NOW! Support energy production, immune support, and tissue repair. Promotes heart health, bone strength and healthy brain and nerve function. Magnesium is an essential mineral for general good health and is crucial to nerve transmission, blood coagulation and energy production. It is especially beneficial to women as it helps with PMT, aids with Menopause symptoms and may keep Osteoporosis at bay. Magnesium deficiency can be caused by some prescription and over-the-counter medications such as antibiotics, cortisone, diuretics and painkillers. 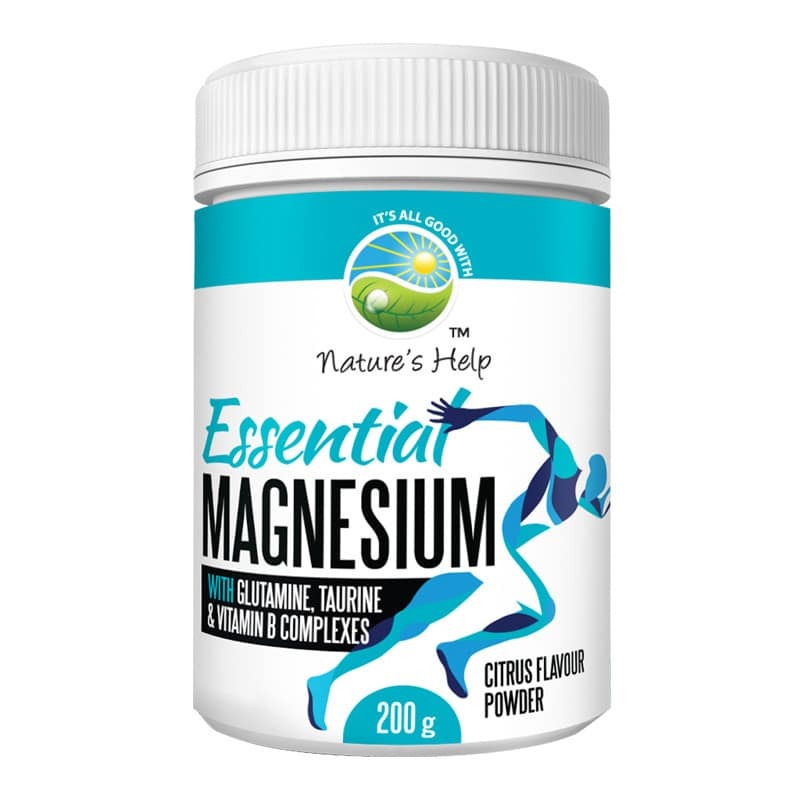 Nature’s Help Essential Magnesium supports energy production, immune support, and tissue repair, including in times of physical training and exercise. Promotes and supports Heart health, Red blood cell production, Bone strength, Brain and nerve function and Healthy skin. Hi Elise. Thank you for your review. Taking magnesium for leg spasms is very common. We are pleased to hear it is helping you get a better nights sleep. I like the taste of this magnesium powder so much better than others I have tried. It’s mildly sweet, not overpowering and it really suits me. I do however wish that it was available in a larger amount as this 200gm size doesn’t last very long at one scoop a day. Great product though. Highly recommend. We offer FREE standard shipping for all Australian orders over AUD$75.00. Our standard shipping option is with Australia Post and advises for 3-7 business days for delivery. For orders under AUD$75.00, a shipping charge of AUD$5.95 will be incurred. We offer express shipping for AUD$9.95 which is guaranteed 1-3 business days for delivery and this service is also through Australia Post. You will be provided with a tracking number when your order has been processed and is ready for dispatch. You can check the status of your package via the Australia Post website. We send all orders through Australia Post (Pack and Track or Registered Mail). International shipping is a flat rate of AUD$20.00 however, we offer a discounted rate of AUD$9.95 for orders over AUD$75.00. International delivery times can vary, we generally advise for 7-15 business days depending on the national postal service and customs procedure of the destined country. You will be provided with a tracking number when your order has been processed and is ready for dispatch. You can check the status of your package via the Australia Post website. Made from natural ingredients, without the use of herbicides, pesticides or chemical fertilisers. No artificial preservatives, colourings, stabilisers or food acids added. This product is vegetarian and vegan-friendly. Take half to one scoop in 200ml of water, one to two times daily or as directed by your healthcare professional. May be added to smoothies, juices, sports drinks or straight into your water bottle. May have a short-term laxative effect and if symptoms persist please consult your healthcare professional. Use only as directed and if symptoms persist please consult your healthcare professional. If you like communicating the old-fashioned way, you can give us a call and speak to one of our friendly team members. We can manually process orders for you over the phone. TURMERIC AUSTRALIA 2019 ALL RIGHTS RESERVED . NO.1 AUSTRALIA'S TURMERIC ONLINE STORE.